calibre includes a built-in E-book viewer that can view all the major e-book formats. The E-book viewer is highly customizable and has many advanced features. You can view any of the books in your calibre library by selecting the book and pressing the View button. This will open up the book in the E-book viewer. You can also launch the E-book viewer by itself from the Start menu in Windows or using the command ebook-viewer in Linux and macOS (you have to install the command line tools on macOS first by going to Preferences → Advanced → Miscellaneous). 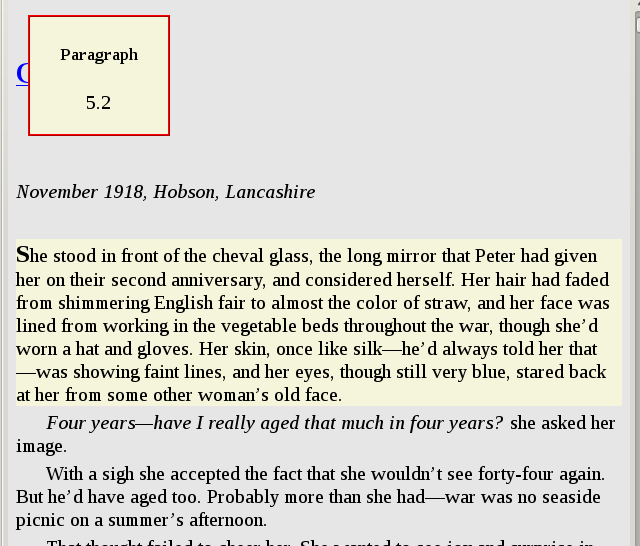 You can “turn pages” in a book by using the Page previous and Page next buttons, or by pressing the Page down/Page up keys. Unlike most e-book viewers, calibre does not force you to view books in paged mode. You can switch to flow mode by clicking on the scroll mode button at the top right. You can then scroll by amounts less than a page by using the scroll bar or various customizable keyboard shortcuts. When you are in the middle of a book and close the viewer, it will remember where you stopped reading and return there the next time you open the book. You can also set bookmarks in the book by using the Bookmark button . When viewing EPUB format books, these bookmarks are actually saved in the EPUB file itself. You can add bookmarks, then send the file to a friend. When they open the file, they will be able to see your bookmarks. If the book you are reading defines a Table of Contents, you can access it by pressing the Table of Contents button . This will bring up a list of sections in the book. You can click on any of them to jump to that portion of the book. E-books, unlike paper books, have no concept of pages. Instead, as you read through the book, you will notice that your position in the book is displayed in the upper left corner in a box like this . This is both your current position and the total length of the book. These numbers are independent of the screen size and font size you are viewing the book at, and they play a similar role to page numbers in paper books. You can enter any number you like to go to the corresponding location in the book. calibre also has a very handy reference mode. You can turn it on by clicking the Reference mode button . Once you do this, every time you move your mouse over a paragraph, calibre will display a unique number made up of the section and paragraph numbers. Bu numarayı arkadaşlarınızla üzerinde konuşurken veya başka işlerin içinde kaynak gösterirken kullanabilirsiniz. Bu numaraları sayfanın üzerinde bulunan Git alanına yazarak belirli bir kaynak alanına gidebilirsiniz. If you click on links inside the e-book to take you to different parts of the book, such as an endnote, you can use the Back and Forward buttons in the top left corner to return to where you were. These buttons behave just like those in a web browser. Yazı tipi boyutlarını havada değiştirmek için yazı tipi boyutu düğmesini kullanabilirsiniz. Tam ekran düğmesine tıkladığınızda görüntüleyici tam ekran olacaktır. Tercihler düğmesine tıklayarak görüntüleyicinin varsayılan olarak kullandığı yazı tiplerini ve açılışta kullandıklarını istediğiniz bir tanesiyle değiştirebilirsiniz. More advanced customization can be achieved by the User stylesheet setting. This is a stylesheet you can set that will be applied to every book. Using it you can do things like have white text on a black background, change paragraph styles, text justification, etc. For examples of custom stylesheets used by calibre’s users, see the forums. Mevcut kitaptaki bir sözcüğün anlamına üzerine sağ tıklayarak bakabilirsiniz. calibre sözcük anlamları için kamuya açık bir sözlük sunucusu olan dict.org adresini kullanır. Sözcüğün tanımı ekranın altında küçük bir kutuda görüntülenecektir. Metin ve görüntüleri fareyi üzerlerinde sürükleyerek seçebilir ve sağ tıklayarak geçici taşıma panosuna kopyalayabilirsiniz. Kopyalanan nesneler başka bir uygulamaya düz metin veya görüntü olarak yapıştırılabilir.